There is a hidden reference in there and nobody has gotten yet…. 🙂 I love it. 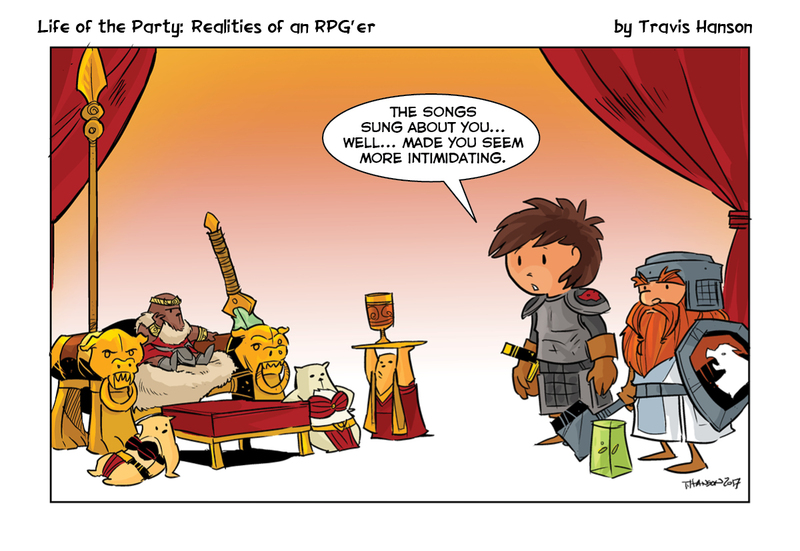 Is that a green Gelatinous Cube with the party on the right? If so I can't find the rust monster but any of the furniture could be a mimic. Ack, typos. And no edit capability in this comment system. Basic googling found me http://lotprpg.weebly.com/home/previous/11 (I'm new to the strip also). Strips #1 -> #107 are there, in reverse order, meaning the home page has the most recent. As of this posting, the link I provide is where #1 is. If the creator adds to the archive, the start point will shift. I have no more idea than you where #108 -> 336 are, and for all his artistic and comedic virtues, Mr. Hanson is clearly not the most proficient webpage designer ever. Where can I find Life of the Party 1 – 336? I see a star wars reference.